While photographing small Acmaeodera beetles on flowers of Tradescantia ohioensis at Packsaddle Wildlife Management Area, I thought I should take a photo of the flower itself. Flowers of Tradescantia species, or spiderworts, are notable for their bright yellow anthers and filaments with numerous hairs. 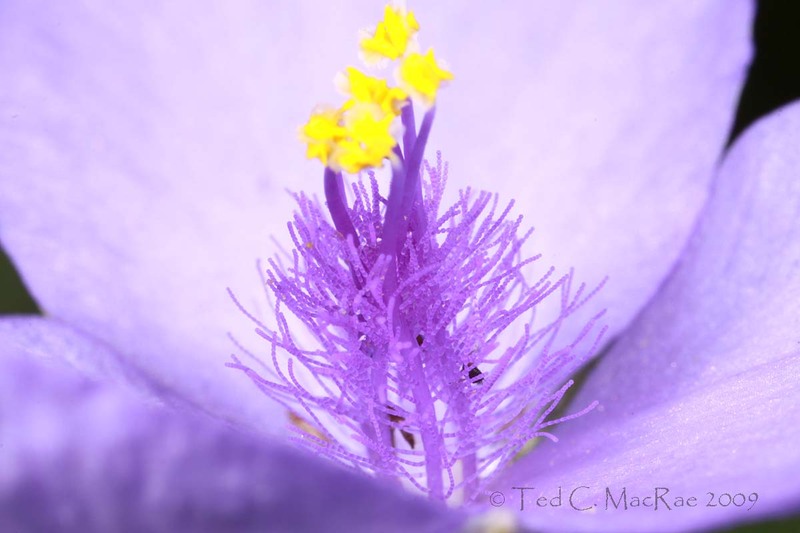 Each of the (usually) six stamens possesses around 70-100 hairs, which in turn are composed of a chain of about 20 large, single cells that are purple in color and contain a large, water-filled central vacuole. The cells can be seen easily with low magnification – click on the photo to see the larger version, with the individual cells that make up each hair clearly visible. I haven’t been able to ascertain the function of these hairs for the plant, but their usefulness in observing division in plant cells (the flowing cytoplasm and nucleus can be seen easily) and their sensitivity to radiation and chemical mutagens have been recognized for many years. The hairs turn pink when exposed to radiation, allowing them to be used as a sort of ‘natural’ Geiger counter. I don’t know that I have ever heard anyone express a particular use for the hairs on the filaments of Tradescantia species. Sometimes, hairy filaments help to trap pollen from visiting insects in proximity to the stigma or act as nectar guides, but I do not think that anyone has determined such “uses” in Tradescantia. There may not be a selective advantage to hairy filaments in the genus. If any botanist happens to read this post and has some insight about this, a comment would be most appreciated. Yatskievych, G. 1999. Steyermark’s Flora of Missouri, Volume 1. Missouri Department of Conservation, Jefferson City, 991 pp. Yatskievych, G. 2006. Steyermark’s Flora of Missouri, Volume 2. The Missouri Botanical Garden Press, St. Louis, 1181 pp. This entry was posted in Commelinaceae and tagged Botany, Great Plains, nature, Oklahoma, science, wildflowers. Bookmark the permalink. Well, I have posted about plants before – but I guess this is my first post exclusively on a flower. Very cool. Spiderwort is a favorite prairie plant for me, but I had no idea about the cells in the stamens, or the radiation effect. I saw the cells when I was taking the photograph, but I still didn’t think they were actually individual cells until I checked my references when I got back. I was shocked to see a flower posted here, but glad to see you going where no beetle man has gone before! Gorgeous picture. Spiderworts are one of my favorites. I have several species, from the native to the hybrid in my gardens and they are an asset to the landscape. Thanks, Mobugs – I love the late May/early June blooming period for spiderworts. Last spring I found a nice population of one of our Ozark endemics, Tradescantia longipes, in bloom in the St. Francois Mountains – what a thrill! Hi Ted- You have certainly taught me something here. Great image. I’ve never looked at these flowers with a handlens, so your image is quite a treat. As far as why the filaments are so thin? I haven’t’ a clue either. Hi Tom – thanks for stopping by. I had noticed the hairs before but never realized the detail in them until I took this photo. I hope somebody can tell us their function. Easy to test would be if the filaments are highly reflective of UV or other wavelengths particularly attractive to pollinators (mostly bees and hover flies in my experience). Seems like an obvious possibility – you woulda thunk it’d been tested by now. I just may surprise you!